Fostex's new recorder is the lowest-cost digital 16-track currently on the market. How have they made it so affordable? Photo: Mike CameronFostex have been making digital multitrack recorders for as long as anyone, so they've had plenty of time to hone their designs to suit a certain type of customer. The company still offer some high-end products to cater for the production-savvy user, such as the reasonably affordable D2424 digital 24-track (which is based very much on the designs of their open-reel machines) but their MR range, comprising the MR8 MkII, MR8HD, MR8HDCD, MR16HD and MR16HDCD, is intended for entry-level users who want to record and produce their own music but have a limited budget and little technical know-how. Though they don't offer a full professional suite of features, they are priced with the budget of entry-level users in mind. The 16-track MR16HDCD reviewed here is essentially the same machine as the MR16HD, the only difference being that it also includes an on-board CD-R/RW writer. Both products are fitted with a USB Host port, though, which means that an external USB writer can be used if desired. Recordings are made at the 16-bit, 44.1kHz CD standard, and stored on a 40GB internal IDE hard drive. Up to four tracks can be recorded simultaneously, using the MR16's quartet of 48V phantom-powered XLR inputs, each with its own level trim control and peak warning LED. Alternatively, each channel has a quarter-inch unbalanced jack input suitable for line-level connections with keyboards, drum machines and so on. The first input channel, labelled Input A, benefits from having both an insert point for use with an external signal processing device, and access to some on-board insert effects, designed specifically for guitar and vocals. The position of a switch on the rear panel determines whether the channel is in vocal or guitar processing mode. For guitar there is a rotary knob for dialling in distortion, plus a choice of Brit Stack, US Metal and '60s Combo amp simulations. The mic signal path offers Dynamic, Condenser and Tube mic simulation options. A separate collection of on-board effects provides three reverb presets and one delay in a send/return loop configuration, and there are also three preset mastering options (Powerful, Natural and Bright) set into the stereo mix-bus path, so that it is possible to optimise the level of a finished stereo track. External effects can also be pressed into service, using two line-level Aux Out jacks as the signal feeds and then patching the outboard processor to any of the four inputs. The inputs, if not being routed to record tracks, can be bussed directly into the mix, effectively making the MR16 into a 20-channel mixer. When a mix is completed, a Bounce Mode button routes the whole mix to a spare stereo pair of tracks or, if all the available tracks have already been used, to a new song. From there the two tracks can be converted to make a stereo WAV file, imported into a computer using the USB 2.0 port, or recorded to an external device by way of the optical S/PDIF Out, located on the rear panel. Alternatively, a stereo master can be burnt using the internal CD-R/RW drive, which, like the USB port, also offers a method of backing up song data. In all, there are 12 channel faders. The first eight simply control mono channels, leaving the remaining four to represent track pairs 9/10 to 15/16. Only the mono tracks have a pan control; the rest are fixed left and right according to their stereo pairing. Above the pan pots are eight effects-send controls for delivering signal to both the internal effects and the Aux outputs. There are no such controls for the remaining channels, but it is possible to single out any of the 16 and have them specifically routed to an Aux out. Playback channel EQ is non-existent, but it is possible to apply some preset EQ settings to the input channels. To each input any one of 33 non-adjustable EQ presets can be applied. The options have been given names like Bright, Narration, Radio 1 and Fat Snare, for example, roughly describing their purpose. There are no virtual tracks for storing alternative takes, but one level of undo/redo is available in case a mistake is made. In terms of performance, there is a useful auto-punch-in record feature, which can be used in conjunction with a loop function and its associated pre- and post-roll times. Some basic digital editing is also possible, allowing whole tracks and parts of tracks to be copied, pasted, deleted, moved and exchanged. The MR16 is clearly built to offer a lot of tracks for the lowest price possible, and for that reason it's unfair to compare it with 16-trackers that cost much more. The closest, in terms of price, is Zoom's HD16, which offers roughly the same core feature set. While the Fostex scores points for its entry-level simplicity, the Zoom includes extras such as a drum machine and bass synth, and has a mode of operation that allows it to act as a remote controller for the bundled copy of Steinberg Cubase LE. Other alternatives, such as the Boss BR1600CD, Tascam 2488 MkII and Yamaha AW1600, have significantly better features but are also more expensive. The MR16 has a very traditional layout, which will be familiar to anyone who has every used a small mixer, multitrack cassette recorder or digital studio. In short, the channel controls line up to the left, the inputs are found at the top, mixer controls in the middle and faders at the bottom. The right-hand side is largely taken up with transport and system controls. Compared with many other 16-track recorders, the MR16 feels quite slender, at 85mm, and takes up very little desk space, measuring just 400mm in width and 265mm from front to back. To avoid a crowding of controls on the diminutive top surface, the faders have been given a very short travel, the control knobs are narrow and the all-important display screen is actually smaller than its grand plastic surround suggests. Nevertheless, everything is large enough to be functional, and the controls are nicely spaced. The overall build quality of the MR16 is not beyond reproach — but that may be understandable, considering that it costs a fraction of the price of many other 16-track machines (it is even significantly cheaper than Zoom's impressively-priced HD16). One thing I immediately noticed, as I took it out of the box, was that the top and lower panels are not fixed together at the sides and moved past one another when gripped. Adding to that first bad impression, I found that the channel gain knobs also flexed considerably when lightly wiggled, as does the large Menu/Enter dial, seen to the right of the display screen. Fortunately, the all-important quarter-inch jack and XLR inputs, which will take a lot of punishment every time a lead is inserted or unplugged, are rock solid. Of the other controls, the buttons are fairly firm, as are the rows of Effect Send and Pan knobs. More reassuring still, the MR16's operating noise level is low, making it very suitable for use right next to sensitive microphones. It also impresses by having an internal power supply, which is unusual on low-cost products such as this. On all digital products of this type the screen is a vital part of the design, yet, as I also recently found with an Edirol mixer, the MR16's display is located so deep within the casing that the lower line of text is pretty much hidden, unless viewed from directly above. Similarly, if you're recording off to the left side the metering for track one is not visible! In the manual, Fostex claim that the MR16 is "just about the slickest, highest quality and downright easiest to use 16-track available on the market." That's quite a statement, so I looked at the multitrack with that sentence in mind. The manual itself is not particularly well written, but someone has obviously thought hard about what the entry-level user will need to know, and then made sure that everything is explained in a suitably non-technical way. Photo: Mike CameronThe MR16 certainly boots up fairly quickly, initially loading the unbelievably dated and cheesy 'Fostex Fever' demo track! The first step in the recording process is to create a new song, but Fostex have hidden the command a few levels down in the on-screen menus, which is a little strange given their ease-of-use mantra. The menu options themselves are accessed via the aforementioned Menu/Enter control, which can be pressed like a button to select parameters, or turned like a knob to scroll up and down menu lists. Once a new song is created, the option of giving it a name flashes, and from there it's pretty obvious what to do next. Most of the Record Select buttons have numbers and letter above them, so it's just a matter of using the buttons to toggle through the relevant letters as required. The menu options also offer the chance to rename, delete and protect song, and to edit song audio data. It can be a little tedious using the one control to scroll through options, select parameters and then edit and confirm any changes, but it is easy enough to do. It's just a shame Fostex didn't include some more buttons to directly call up the Edit, USB, Song and System options, which are located within the menu system. The CD writer is the only difference between the MR16HDCD and the slightly cheaper MR16HD. However, both units can be connected via USB to an external CD writer.Photo: Mike CameronActually making a recording is very simple. The routing methodology is not obvious at first, but one read of the manual makes it clear. In short, it's a no-brainer, although sensible levels still need to be set. In terms of recording quality, the MR16 does quite a good job, whether it is dealing with vocals, keyboards, drum machines or guitars. The on-screen metering is not scaled, though, and I'm not sure it actually reflects the action of signal transients, having found that recordings sounded better with the peak level set a few blocks below the apparent clip point. The guitar and amp models are no replacement for the real thing, but they are adequate for demo work. Similarly, the mic simulations are useful tone variations even if they aren't very special. I'd have preferred to have had some compressor/expander options instead, although the models may actually be little more than a combination of EQ and dynamics processing anyway. And, given the emphasis on guitar processing, a tuner would be handy too. All the effects and processing options are extremely easy to apply but it's a bit of a case of loving it or leaving it, because there are almost no parameters to adjust. The reverb options of Room, Hall and Plate have only a time adjustment, and the delay fares little better, having only a delay time and three style options. In some situations it's not a bad thing to have a limited palette, but a little more control would be welcome. The EQ presets are fine and fairly useable, it's just a shame there is nothing like them available as proper channel EQ. Ultimately the lack of effects-send options is a handicap, as the only way to apply effects to channels 9 and up is to route them to Aux 1 and 2, and only one channel can be sent to each output at one time. 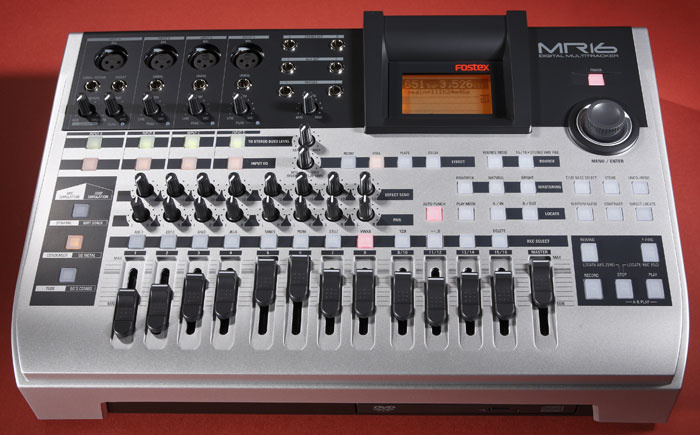 The MR16 could also do with a solo function: do Fostex really expect users to pull down 11 carefully positioned faders each time they want to individually monitor what is recorded on a particular track? Operating over USB, the MR16 proved itself to be quite slick. Once switched into the relevant mode it was recognised by the PC as an attached device, giving access to its files. These are then easily copied across for archiving purposes. 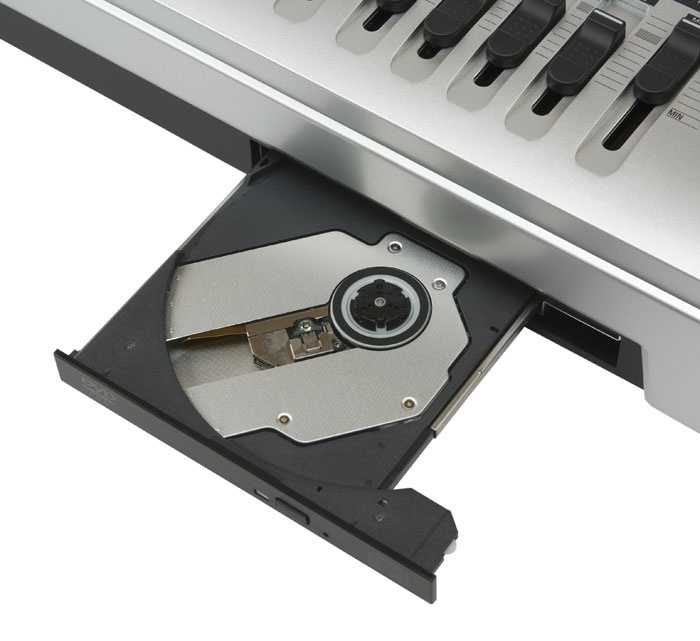 Unlike some of the competition, it isn't really set up to allow the importing of samples, although it is possible to load up such material into a new song using the internal CD-R/RW drive. Harsh criticism to the MR16 for lacking some of the mixing, effect and recording options of other 16-track recorders would be unfair: given its low price and mission to be extremely easy to use, it isn't aiming to compete directly with such products. There are plenty of people who just want a no-nonsense recorder that gives them the opportunity to record a high number of tracks, apply some reasonable stock effects, and master it all up in the one box for the minimum cost, and for them this product is ideal. Fostex's claim that it is "just about the slickest" thing on the market is a bit over the top, though in terms of its ease of use they may have a point. Despite the few workflow issues outlined above, the MR16 can be mastered very swiftly. For more serious work, the second-hand market is full of similarly priced semi-pro 16-trackers, and anyone who thinks they might want to get thoroughly involved in producing their recorded material should consider those products as an option. In most cases, given their drive to simplify the MR16, it is easy to understand why Fostex have left off certain features, but they really should have included a track solo function and some better Aux send facilities for tracks 9 to 16. 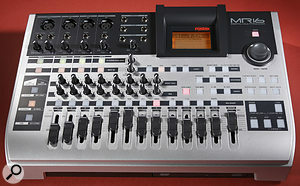 The limit of just four tracks of simultaneous recording makes it less attractive as a live recorder — and there are undoubtedly many bands who would like to be able to use this machine to capture a live performance and mix it to CD with the minimum of fuss, if only it were capable of handling more input sources. On the plus side, the MR16 is very affordable, it records well, seems very stable and quiet in operation, has two headphone outs and even has an internal power supply. What's more, this is an efficient product that's easy to use and is capable of producing perfectly decent demo material. Its no-nonsense design is ideal for musicians without much technical know-how. Aspects of its construction could be better. Just four tracks of simultaneous recording. Only one level of undo/redo. The Aux send options are too limited. A very low-cost 16-track recorder, streamlined for ease of use. It does lack one or two useful features and it feels slightly flimsy in some respects, but for demo work it performs well.